Some foods are charismatic by virtue of their story. The Poulet Bleu’s development in North America is as exciting as its blue feet, and while Jimmy Nardello peppers look entirely commonplace, their name, and the history it alludes to, give them a leg up on other, similar foods. Still others wear their oddities in the open in odd shapes and colors, such as the Black Spanish Radishes from Fiddler’s Green Farm that we picked up at the Farmers’ Market. 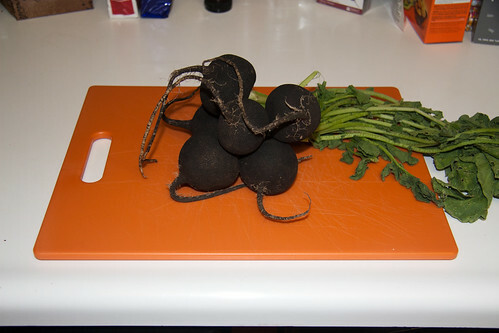 Black radishes have a dark black skin and resemble beets in shape and size, being much larger than the red radishes we typically eat. Our radish monger advised us to peel and roast them as we would potatoes. Being a household that often roasts root vegetables in the winter, it seemed like we could easily fashion a recipe around these dark specimens. We began by peeling the black skin to reveal the pale white flesh. The contrast between the outer and inner radish was rather impressive and surprising. I sliced the radishes into bite sized pieces and took the opportunity to taste a bit. 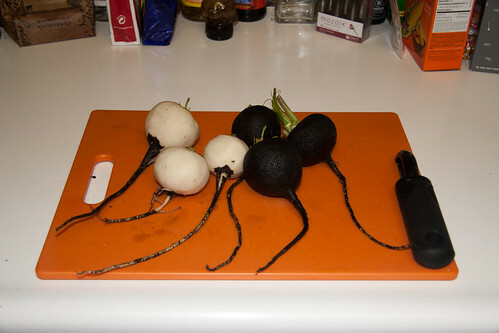 Raw, the radish was extremely bitter and astringent. Jen gave me a look that questioned my resolve to continue with the dish, but I assured her I thought that roasting would mellow the flavors and arrive at a mild but interesting vegetable dish. 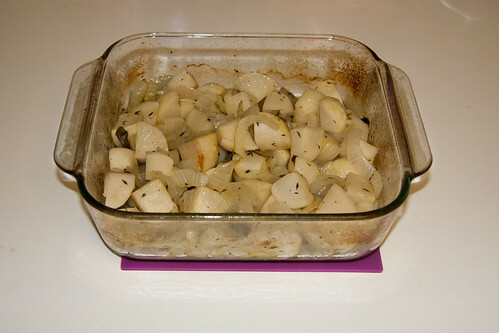 We combined them with a chopped onion, seasoned them with salt and thyme, then drizzled on some olive oil and white wine and placed them in the oven to cook. 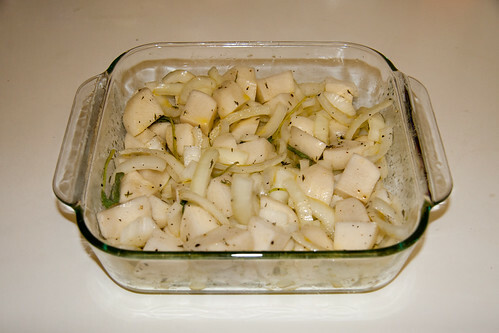 The radishes took about an hour to cook through, becoming slightly translucent and a little brown around the edges. 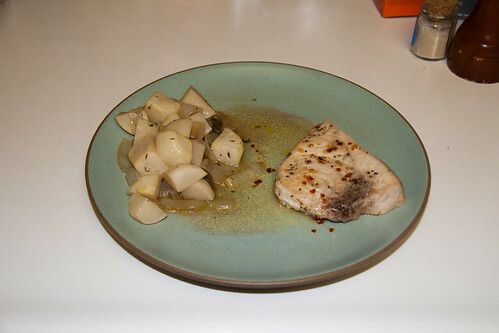 We plated them alongside a tasty piece of swordfish and headed to the table to enjoy the meal. Unfortunately, I can’t say that the roasting did enough to mellow the bitterness. I made it about halfway through my serving, Jen less than that, before we both decided to drop the brave faces and admit defeat. I had to concede this round to the radishes, but I’ve read that covering them with salt then squeezing the juice out can reduce the bitterness. I’ll have to try that in the future. In the meantime, at least the swordfish was good.